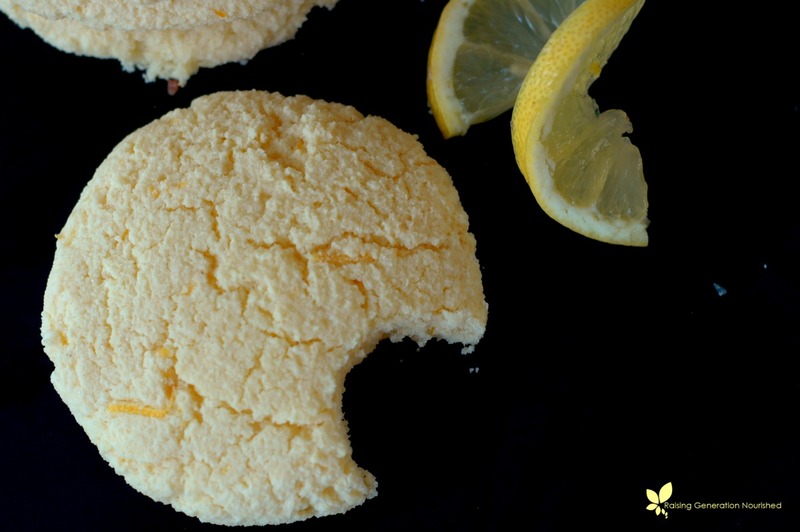 A cross between a lemon bar and shortbread, these lemon breakfast cookies have an amazing sweet lemon flavor to brighten your day! 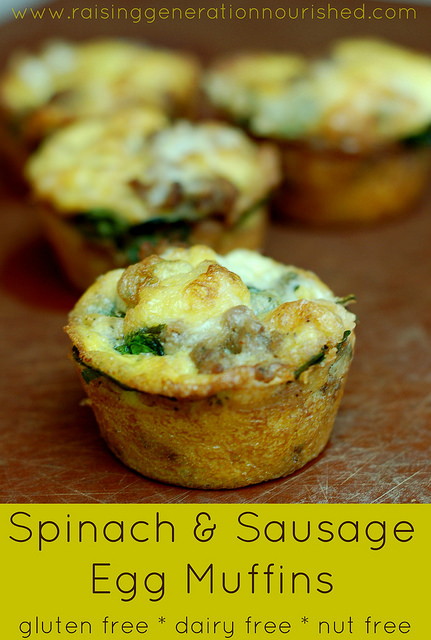 Stash them away in the freezer for busy mornings too! We have been having the *best* summer. 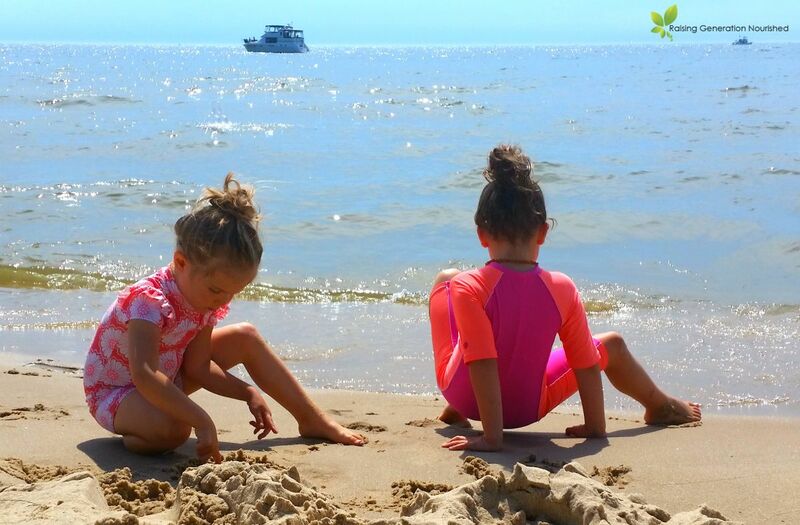 I’m talking the perfect balance between fun and busy beach days, to lazy, sit in the sun days at home. This summer I decided I was going to take a couple months “off” from getting up way before my kids so that I could just take a bit of a break from early mornings. I know they will be back come the start of the school year, so I gave myself a little permission to get a little extra sleep for the summer! It has been so nice. 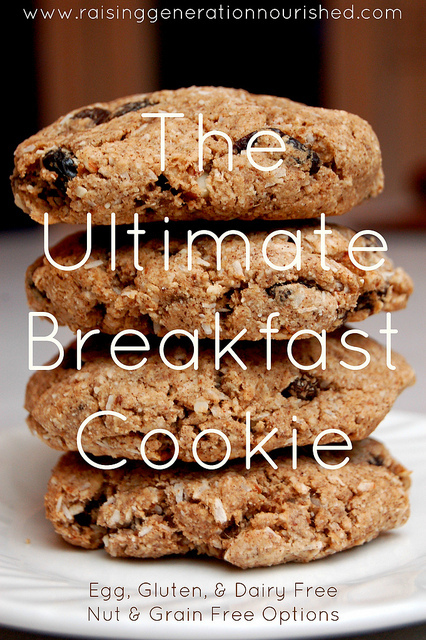 For the most part we have been taking our mornings slow, and I have been relying on my staple breakfast cookies from my freezer stash on mornings that I have hungry kids before I’m able to turn the stove top on for eggs! 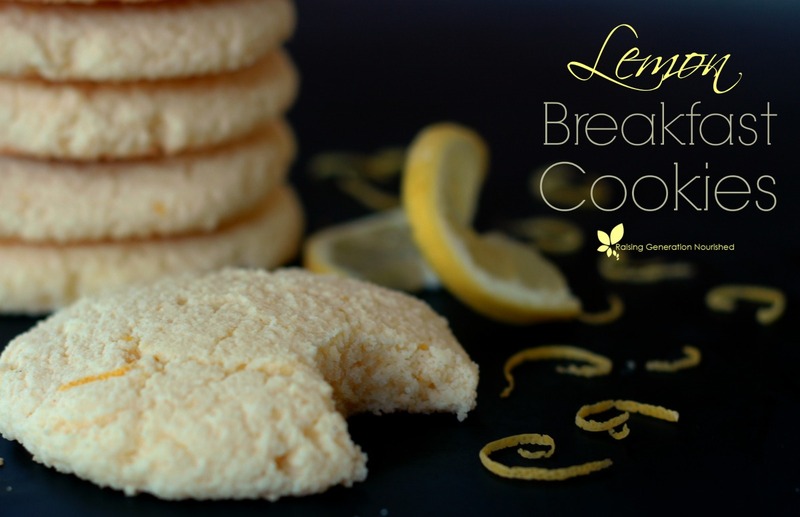 A cross between a lemon bar and a shortbread cookie, these lemon breakfast cookies have a sweet lemon flavor and a really soft texture. The batter is super quick enough to prep right in the morning while the oven preheats, or you can make up a double batch or so for the freezer so they are even more convenient. I am planning on having somewhat of a breakfast rotation schedule for the start of the school year to make mornings a no brainer and these will definitely be on the list! If you have lighter breakfast eaters, the mixture of protein, fat, and carbohydrate/fiber in the cookies will most likely be enough for a “meal” for them – there is a good balance. I have pretty big breakfast eaters, so I make our cookies slightly smaller and add hard boiled eggs/raw milk or a smoothie. Either way breakfast can be done really quick. 2 pastured eggs If you are egg free I think flax eggs or gelatin eggs will work for the bind - they just might not puff up as much which doesn't matter! Blend the butter and honey with and beaters until fluffy. Add the eggs and beat until frothy. Add the rest of the ingredients and blend through until combined. Roll balls of the dough and flatten to the size cookie you want on a silpat or parchment paper lined baking sheet - they won't spread out so make them how you want them. Depending on how big you want your cookies you can get about 7 cookies out of this batch. 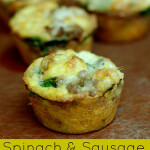 For more real food breakfast ideas you can check out my Breakfast Ideas board on Pintrest! 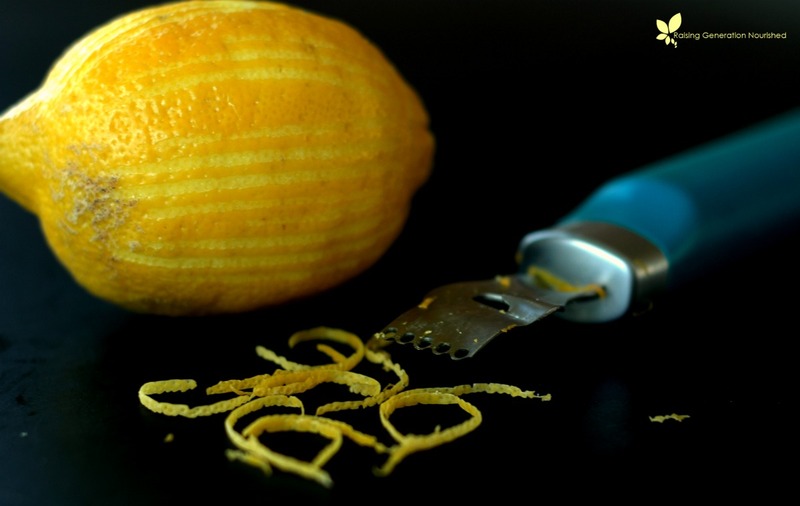 You had me at lemon! Love these cookies for breakfast. These sound amazing!!! 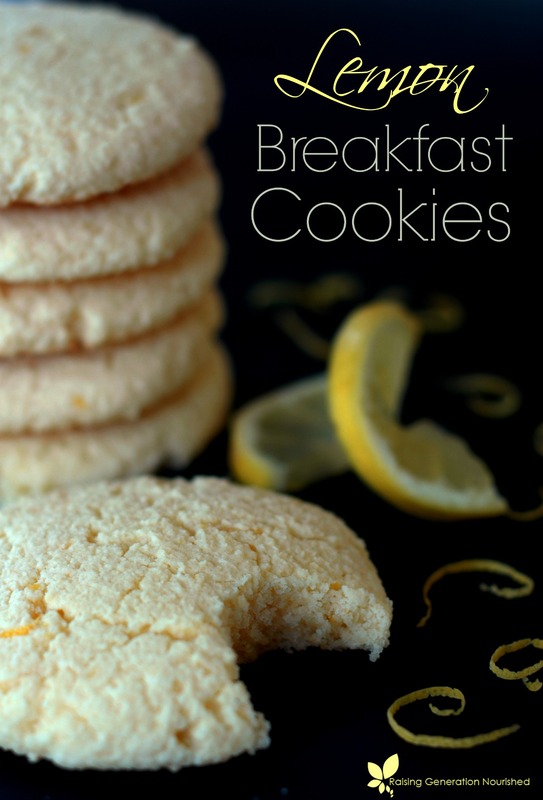 I love lemon and would be so happy eating these for breakfast. These sound wonderful. Is it salted butter you use? And to make it “soft”, do you let it warm a little at room temp, or whip it? Is there a substitute I could use for the coconut flour? I don’t like the taste of it. Hi Janelle! I don’t like the taste of coconut flour either! You can’t taste it in this recipe (and I can tell you that for sure because my husband *really* hates the taste of coconut flour! ), but if you want to try using almond flour that would work great too – just double the amount! 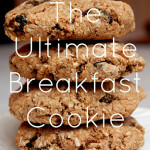 Love the idea of breakfast cookies and a quick nutritious start to the day ~ You are one organized mom! Have never used tapioca flour so will need to find that locally and then.. I am excited to try these. Love LEMON!! Beautiful recipe Rene. Pinned and shared! Lemon is my favorite flavor for all baked things 🙂 I’m going to have to try these out! 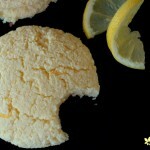 I have a weakness for lemon baked goods! 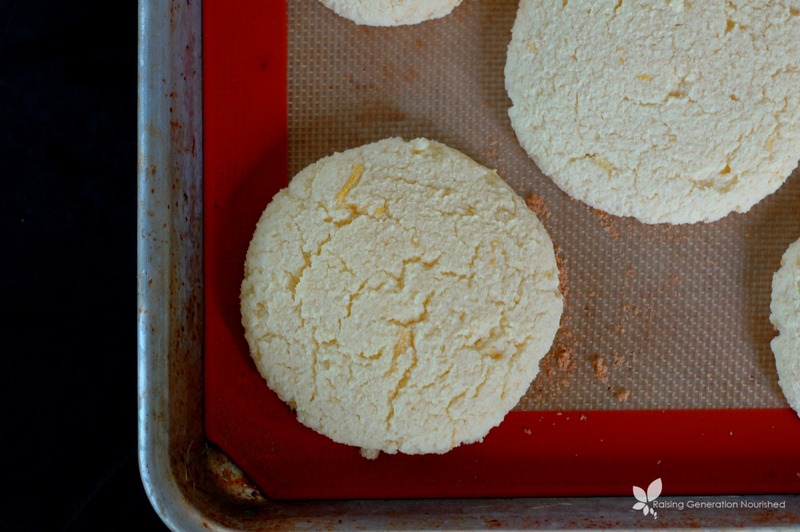 I’ve never used tapioca or white rice flour, but I may need to run out and grab some so I can make these cookies! Hi Karen! Yep that should work! Has anyone tried adding some protein powder (whey or other) in place of some of one of the flours? If so, what ratio did you used? These look amazing! 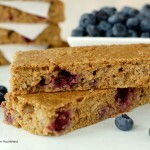 How do you make the flax egg? Hi Bess 🙂 One flax egg is 1TB flax meal with 3TB water and stir – let it sit for a few minutes in the fridge while you make the rest of the batter and add it in! They look so delicious! And I’m glad that they’re sugar free! I’m making these tomorrow! How many cookies does the recipe make, and about how many inches in diameter are they? Thanks! Hi Cammie 🙂 You can make them whatever size you want – I have never measured them but I get about 7 or so out of this batch! OMG my new favorite cookie!!!!!!!!!!!!!!! Hi Beth! Oh good! Glad you liked them! Hi..can I use regular eggs in this recip& if so, how many? Thank you! Hello! 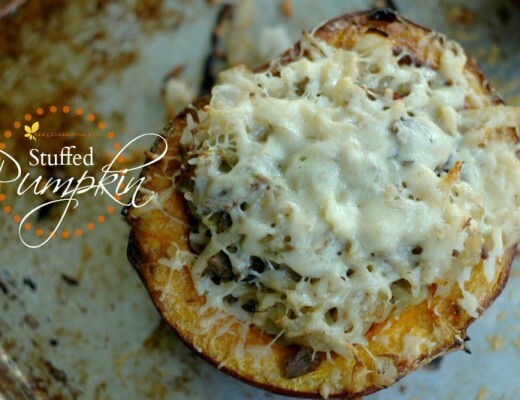 These look so yummy, and I have all the ingredients at home right now! Can’t wait to try them! I’m new to your blog via Pinterest. I’m loving what I see!! It’s so great to “meet” a like minded mama! I have a question about the honey. Does the baking heat damage the enzymes of the raw honey? I’ve seen a few blogger baking with raw honey, but I don’t want to waste my precious liquid gold if the heat compromises the benefits. Your thoughts? Hi Rachael! You are right – the heat does damage some of the nutrients in the raw honey but it does not damage the minerals. So those are intact and honey affects blood sugar differently than straight sugar which is why I like to use it. You could use pure maple syrup or blackstrap molasses if you wish which are both excellent in mineral content and better on blood sugar than plain sugar. The color and flavor will be a slightly different (the flavor using molasses will be quite different but still good) but it would work. I hope that helps! These look great! Wondering if anyone has tried with lime instead? Hi Sheila! Thank you for your kind words! Yes! I have been working on that recipe and it isn’t quite ready to share yet – I am really close though and should have it up by year’s end! Hi Lisa! Yes that should work! If you don’t care for a coconut flavor to your cookie you could try palm shortening instead – I tend to feel like palm shortening bakes more like butter and gives a better flavor. I hope that helps! Hi Renee! Just popped by to let you know these are one of our favourites! I usually make them a little smaller and we eat them for snacks (for some reason my toddler can’t get behind cookies for breakfast. What?!!) But we love them and they are in regular rotation here. There’s a double batch in the oven right now. Thank you for keeping our bellies happy and nourished! These cookies are wonderful! My whole family loved them. I store them in the freezer and just let them sit on the counter for a few minutes in the morning. They are a great consistency. Hi Heather! That is so great! I’m glad you enjoyed them! Hi there! How do you freeze them? In a zipploc bag? Do you put something (parchemin paper maybe) between the cookies? Hi Veronica! I just let them cool and pop them in a freezer bag! 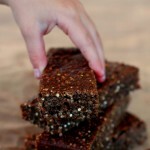 No parchment paper needed! Wow, these look great! I have 2 lemon trees that are almost always producing. But I have a question about being dairy-free, and use of butter. Is there a good alternative? Hi Pamela! Softened coconut oil should work! What is the approximate time for the second beating? You say “till frothy” but I beat them about two minutes with no real change from 10 seconds. Also, how to tell when they are done? Do they get toasty on top? Yummy. And so good with tea. 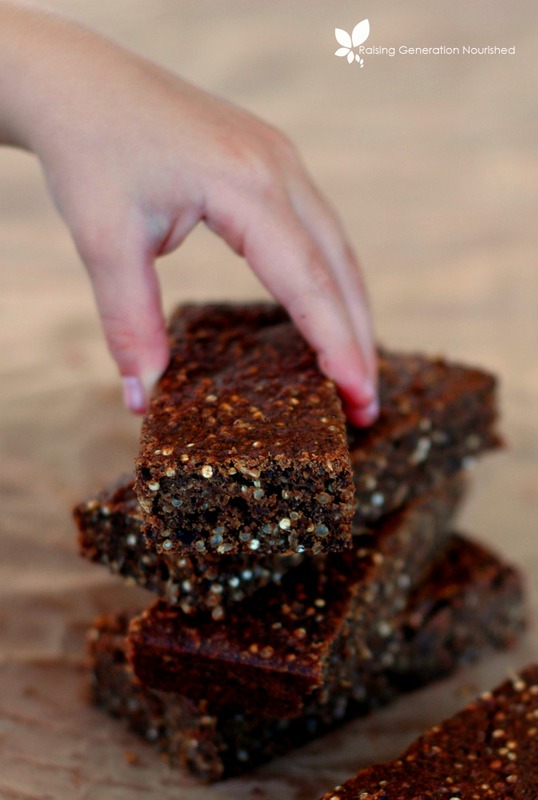 These are a treat we are happy to indulge in – we go right on ahead and make a double batch! Easy to amend to fit dietary needs (we like brown rice syrup in place or combined with honey) and always welcome with the soft, fluffy, texture. 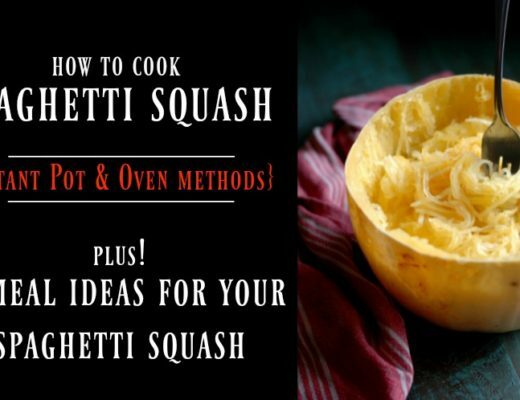 Thanks for another great recipe, Renee! Glad you enjoyed them Danyelle! These look wonderful! Do you think any other regular flour would work instead of tapioca and white rice? We are not a gluten-free home, and I have no experience with those flowers. 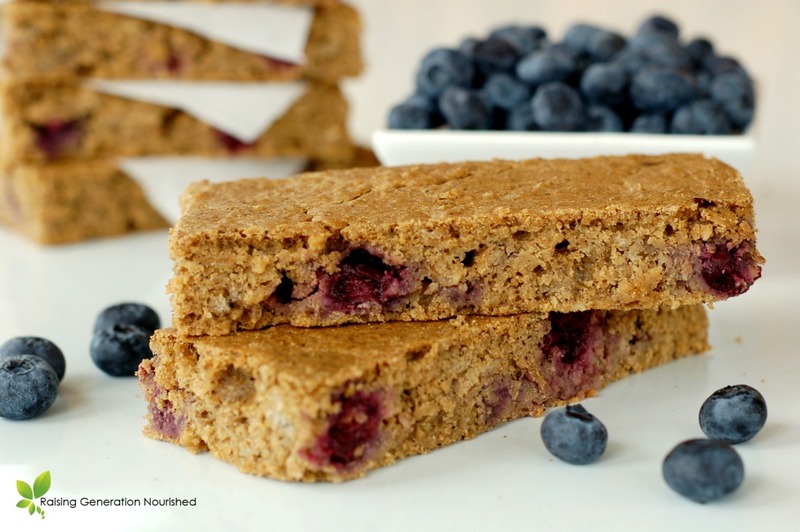 I do have coconut flour on hand… I mostly use einkorn and whole wheat in all of my baking. I also have some almond flour I use. Thoughts? I’m sure it would work, you will just have to play around with the amount of einkorn or wheat. Coconut flour will be too dry unless you add more liquid or back off on the amount and you don’t want all coconut flour or it will be brittle.